Scam-backscatter prevents backscatter (accept and bounce) on mail servers which don't host mailboxes locally. It validates mailboxes by verifying the recipient addresses hosted on a different mail server. Scam-backscatter was designed to use minimal resources. It can filter several hundreds of thousands SMTP connections or more depending on system and hardware configuration. Our statistics show that the milter stops approximately four in every five messages as the recipient addresses are invalid. That translates into a 80% decrease in mail filtering requirements. 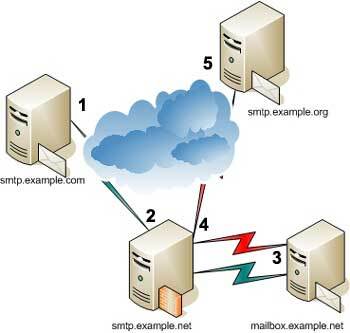 An email is sent by smtp.example.com with a forged sender address of user1@example.org to user2@example.net. The email is accepted for delivery by smtp.example.net. The email is then forwarded to mailbox.example.net. As there is no user2 mailbox on mailbox.example.net, a bounce message (non-delivery receipt) is generated by mailbox.example.net to notify the sender address (user1@example.org) of the delivery failure. The bounce message is sent to the mail server at smtp.example.org. user1@example.org receives the bounce message. Your mail server can prevent backscatter by validating the recipient email address in step 2. 2. Change the current directory to the one where the scam-backscatter source code was extracted. to Makefile. If you are using FreeBSD, rename the Makefile.freebsd file. The Makefile.bsd file can be used for Solaris. If USEMAILERTABLE is defined as a compile-time switch, Scam-backscatter reads the list of domains to verify and the backend SMTP server IP address from sendmail's mailertable file. If EHLO is defined, use EHLO instead of HELO when verifying against backend. When BITBUCKET is defined, Scam-backscatter silently deletes invalid recipients. This feature is not recommended as it can cause loss of mail. The ALLDOMAINS feature turns on verification of recipient addresses for all domains against the SMTP backend. The BackAddrDomain setting is not required. The line should be added to the .mc file used to create the sendmail.cf. Start the milter with the -p inet:8900@localhost parameter. The configuration file used is /etc/mail/scam.conf. The BackSMTPServer can be either a hostname or an IP address. The setting should be defined before the BackAddrDomain setting. When there are multiple BackSMTPServer settings, the BackAddrDomain setting is mapped to the BackSMTPServer setting preceeding it. Only one BackSMTPServer setting is allowed with the ALLDOMAINS feature. These two settings are not required with the USEMAILERTABLE feature as the mapping of BackAddrDomain to BackSMTPServer is read in from the mailertable file. The following entry is optional. It should be used if the backend mail server is running on a non-standard port. Scam-backscatter will use tcp port 25 by default. Once Scam-backscatter verification finds a valid email addresses, it gets cached. The default expiry value is 86400 seconds. Invalid email addresses are also cached by scam-backscatter. The default expiry value is 3000 seconds. When BackAddrSubdomain is set to yes, Scam-backscatter will verify subdomain email addresses (user@mail.example.net) as well if example.net is listed as a domain to be verified. This default value is no. The BackList setting points to the file where the list of valid and invalid recipient addresses is read from at startup and saved to at shutdown. The TimeoutSMTPconnect setting determines the time to wait (seconds) for a connection to the backend SMTP server. The TimeoutSMTPReply setting determines the time to wait (seconds) for a reply from the backend SMTP server after sending a SMTP command. server using port 587 instead of port 25. If your configuration file has one or more BackSkipDaemon settings, add the MSA daemon as it is only automatically included when the setting is not defined. Scam-backscatter does not perform verification for locally submitted mail. Yes will return a temporary failure. The Mailertable setting provides the path to the mailertable file. The default value is /etc/mail/mailertable if the setting is undefined. will read the recipient addresses at startup or save them at shutdown. Scam-backscatter can cache valid and invalid recipient addresses. If the SMTP backend is out of service, you can stop the Scam-backscatter milter, increase the BackValidAddrExp and BackInvalidAddrExp values and restart the milter. Scam-backscatter initiates a SMTP session with the Backend SMTP server. If the Backend rate limits SMTP connections, it may cause Scam-backscatter to fail. Scam-backscatter may fail if it the system runs out of file descriptors. Refer to your operating system documentation to find out how to increase that. Refer to our milter resource for information about libmilter. Copyright © 2006-2010 Eland Systems All Rights Reserved. Please send your comments and bug reports to scam+back@elandsys.com.